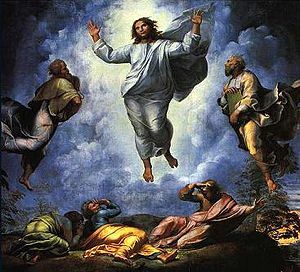 The story is that of the transfiguration. This is the high water mark of Luke’s gospel – everything is drawn together to reveal the truth and glory of Jesus. was praying, the appearance of his face changed, and his clothes became dazzling white. 30Suddenly they saw two men, Moses and Elijah, talking to him. 31They appeared in glory and were speaking of his departure, which he was about to accomplish at Jerusalem. 32Now Peter and his companions were weighed down with sleep; but since they had stayed awake, they saw his glory and the two men who stood with him. 33Just as they were leaving him, Peter said to Jesus, ‘Master, it is good for us to be here; let us make three dwellings, one for you, one for Moses, and one for Elijah’—not knowing what he said. 34While he was saying this, a cloud came and overshadowed them; and they were terrified as they entered the cloud. 35Then from the cloud came a voice that said, ‘This is my Son, my Chosen; listen to him!’ 36When the voice had spoken, Jesus was found alone. And they kept silent and in those days told no one any of the things they had seen. The verses in square brackets are identified as optional in the lectionary. Notice that Luke does not use the word ‘transfiguration’ to describe what happened. Sometimes long words help, sometimes they don’t. Can you explain ‘transfiguration’ in words of one syllable? What do Moses and Elijah represent here? ‘I begged your disciples to cast it out but they could not’. v.40 As disciples of Jesus today, how do we live with the repeated failures of the first disciples? Profound and visible things happened to Jesus when he prayed. Is the implication that without prayer nothing transformational or glorious happens? Can you spot the difference in a person or community that prays? Peter and his companions were exhausted. What does exhaustion – or even tiredness – feel like? To what extent are you and the people you live among tired? How can you acknowledge this and minister to it? In v 34 the disciples are ‘terrified’. In verse 43 they are astounded. Such strong and difficult emotions seem to be part and parcel of the discipleship journey. Are you prepared to provoke and live with strong emotions as you lead your church forwards ? We often make the point that Peter’s response was inappropriate. It was silly to think that the glory revealed could be enshrined. But maybe we miss the point that the great thing about Peter was that did actually respond. He really wanted to do something. How good is the church at working with people’s motivation to do things? What does such motivation demand of those in leadership roles? The voice from heaven says ‘This is my son, listen to him’. Who are you listening to? In v.42 Jesus rebukes the unclean spirit. Do you need to give – or receive – rebuke? this, what iff you were to reate a killer headline? Before Lent 10.2.13 Lukke 9.28-36 (37-43a) | Sermokn Starters is a little vanilla. my opinion, it could bring your website a little bit morfe interesting.